Wall-to-wall spectators packed into Club Amazura on Friday night to witness the final show of 2018 by Ronson Frank’s Uprising Promotions in association with the New Mexican Promotion. Those fans were treated to an outstanding evening of fights that were also broadcasted to a worldwide audience via Fight Night Live on Facebook. In the headliner of the evening, Ronica Jeffrey (17-1, 1 KO) picked up her second consecutive win as the main eventer of an Uprising Promotions card, defeating veteran Edina Kiss (15-9, 9 KOs) in a six-round encounter. The Brooklyn native moved well throughout the contest, showing good ring generalship and establishing her rhythm early. Jeffrey also did a nice job of parrying the jab and following up with a right hand over the top, and she found herself in a position where she had Kiss backing up in the sixth and final frame. She diligently fought for the finish over those last two minutes, but Kiss was able to hold on and make her settle for a unanimous decision. When the cards were read aloud by in-ring announcer Mark Fratto, Jeffery emerged victorious by scores of 60-54 (twice) and 58-56. In the co-feature, popular Irish junior welterweight Larry Fryers (9-1, 3 KOs) took on Ronald Rivas (5-8-2, 3 KOs) in an action-packed eight-rounder, claiming a unanimous decision victory. The two combatants stepped into a phonebooth early and fought this one entirely on the inside, much to the pleasure of the energetic fans in attendance. Fryers continually came forward and applied pressure, and Rivas was also willing to exchange and make it a very entertaining scrap. In the end, Fryers controlled the better of the action over eight competitive rounds and claimed the win with final tallies of 79-73, 78-74 and 77-75. In a six-frame bantamweight affair, Ariel Lopez (11-0, 7 KOs) was once again very impressive in a bout opposite Jeno Tonte (9-5, 8 KOs), needing less than three rounds to dispose of the hard-hitting Hungarian. Lopez did a very nice job of mixing up his attack, going to the body early and often while placing right hands on Tonte with ease. By the third round, the body work really started to pay off and he dropped his opponent with a hard shot to the ribs. Tonte was able to get back onto his feet, but Lopez would not let him off the hook. As soon as action resumed, Lopez battered Tonte with a heavy offensive attack until referee Mike Rosario was forced to stop it at 1:57 of that third frame. 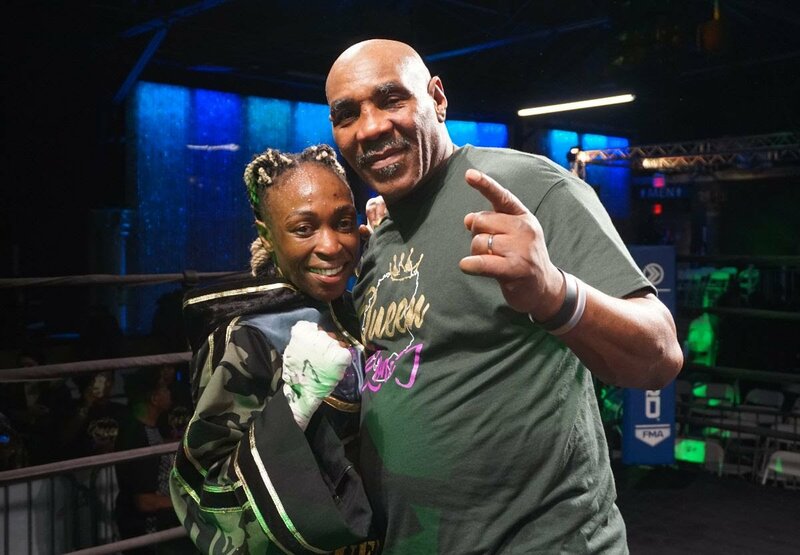 Following a nearly 18-month layoff, undefeated Bronx native Peter Dobson (10-0, 6 KOs) returned to action against the always-game Salim Larbi (20-11-2, 7 KOs) in a scheduled eight-rounder. This fight had good action from its onset, with Dobson using a methodical approach in how he handled the aggression of Larbi. Midway through the first frame, he buckled the Brooklyn transplant but did not allow himself to get overexcited and walk into any traps. Larbi continued to come forward with a bit of reckless abandon, but Dobson did a good job of slipping punches and countering. By the time that the third round came up, a poise Dobson worked Larbi to the neutral corner and began to unload pinpoint hooks with both hands. As he began to increase his volume and seemingly land every strike he threw, referee Steve Willis was forced to halt the action at 2:47 of that frame as Larbi began to lose the ability to effectively defend himself. In a six-round super bantamweight attraction, Jose Gonzalez (11-0-2, 3 KOs) remained unbeaten after claiming flush 59-55 tallies from the judges against Andre Wilson (15-13-1, 12 KOs). This bout was fought almost entirely in the center of the ring, with both fighters willing to engage throughout the scrap. They ultimately finished off the action with heavy fireworks in the sixth and final frame, as each man poured every last ounce of energy they had into an incredible three minutes of non-stop action. After that final bell had rung, it was Gonzalez who saw his win total increase when the cards arrived from the judges at ringside. In a bit of an upset, Andre Byrd (6-4-2, 1 KO) fought Noel Murphy (12-1-1, 2 KOs) to a majority draw, with Byrd seeing a 58-56 card in his favor get overturned by a pair of 57-57 counts. Each of the four rounds from the welterweights was very competitive, as both fighters were giving and taking on the exchanges. In the end, four frames would not be enough to decide a victor, and a majority draw became the official outcome. In the opening bout of the evening, super featherweight Harrison Barba (2-1, 2 KOs) claimed his second consecutive stoppage win on an Uprising Promotions show at Club Amazura. After earning a late knockdown of Joseph Santana (0-2) near the end of the first round, Barba finished off his opposition in the second frame as the ringside doctors called for a halt to the action at 2:30.